Palmetto Citizens Visa Gift Cards make the perfect present and give recipients the flexibility to choose what they really want. Pick one up today at any of our offices. 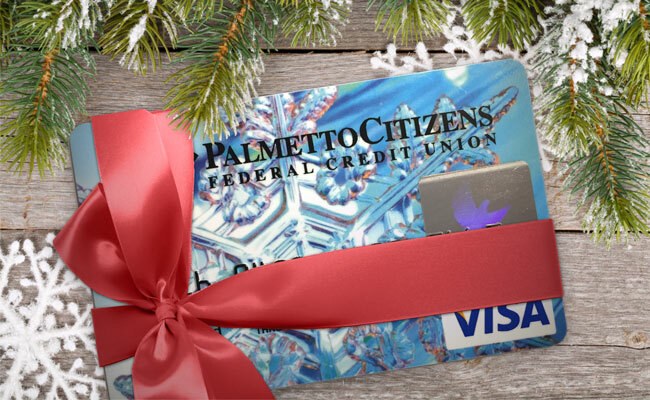 Take the guesswork out of gift giving with a Palmetto Citizens Visa Gift Card. Give them to friends, family or anyone you need to find the perfect gift and let them choose when and where they want to shop. Cards are available in whole dollar amounts from $10 to $1,000. They can be purchased for the amount of the card plus a low fee of $2.50. Upon purchasing the card, the recipient can begin shopping immediately. Balances and recent transactions can be reviewed anytime online or over the phone. Visit your nearest Palmetto Citizens Service Center to purchase your gift card today. *Cannot be used at ATMs or for cash advances. Limited for use in the United States (including extensions such as US military bases) and its territories. Monthly inactivity fee of $2.95 charged after 12 consecutive months of inactivity. Lost/stolen replacement card fee is $5.00. Visa® gift cards are issued by MetaBank®, Member FDIC, pursuant to a license from Visa U.S.A. Inc.